I recently found myself in Savannah, GA. We didn’t have time to get out and walk but we were able to drive through the historic district and see some pretty nice things. 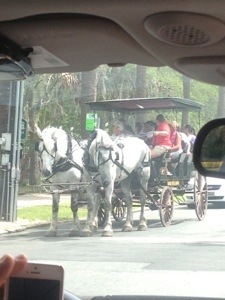 This pair of horses was pulling a group of people seated on a large buggy. It was hot, crowded, and noisy. 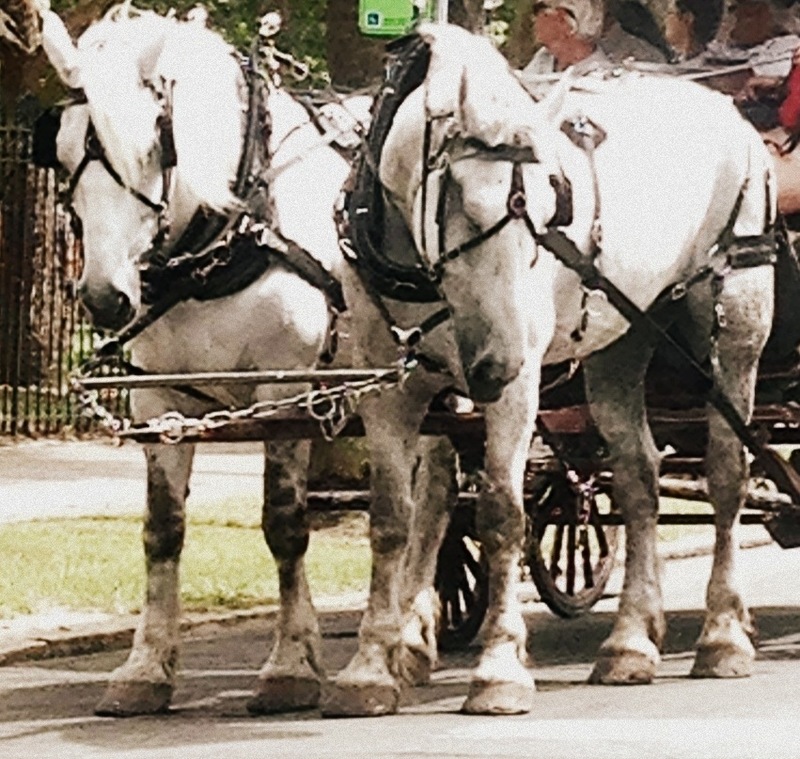 I felt bad for these beautiful white horses who apparently make their living by pulling tourists in a buggy around the city streets. You can also upload it to your iPad. Have fun using it and hopefully next time I’m in Savannah I’ll have enough time to visit Paula Deen’s restaurant! Hubby and I went to Savannah a few years back. It was a beautiful place to visit. I think (in my first life) I was born and raised in the South because that’s where I feel like I belong. Haha, yes it is rather nice down south…everyone is so polite and I love the accent! I’ve visited Savannah several times and always found it to be a beautiful place. I have to also feel sorry for the horses. We took some sort of trolley when we went on a tour. The drive through was over all too quickly and I look forward to returning some time soon so we can go visit the antique stores and museums in all those beautiful old historic buildings. We passed in front of “The Lady & Sons” (Paula Deen’s restaurant) but didn’t have enough time to stop. Both my daughter & my son have visited there with their families and they loved it! And humid I thought we’d faint! Loved the history and felt we wewe were “Somewhere In Time”….love Charleston, SC too. Thanks for the tip on photo app. I’ve always wanted to go to beautiful Savannah! If you go again post loads of pics Daisy. love your blog!